Home customer care customer relations customer service direct marketing small business social media Is Customer Service on Social Media for You? I'm sure you've all seen them - the stories, comments, or other posts on Facebook, Twitter, Google+, or another social platform from people dissatisfied with some aspect of a product or a service from a business. More so than ever, consumers are turning to social media to share their annoyances and horror stories. However, they also turn to social media to connect with brands and businesses - to seek information, ask questions, and resolve problems or concerns. Seventy percent (70%), do so on a monthly basis. Thirty percent (30%) prefer social care over contacting a company by phone. Facebook, through both the company's page and the user's personal page (29% and 28% respectively), are where users are most likely to comment or ask a question. If your business has an existing presence on social media and is looking for a competitive edge, or just to improve your relationship with your followers, taking on social care may be something to consider. However, it does require commitment. 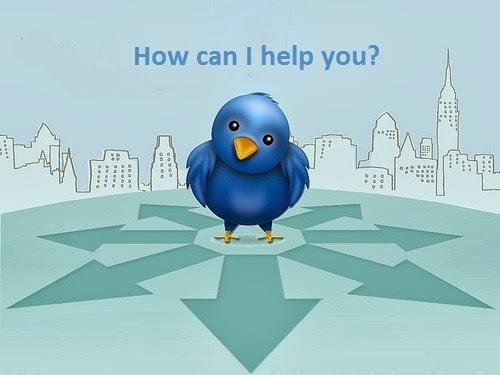 Here are some tips I've come across for using social media as a customer service channel. Be proactive. Listen and participate in conversations. You can learn so much from simply listening to what your customers, or the public, are saying on social media. If a conversation is happening and you can add to it, do so. Through active listening, you'll be ahead of the curve in knowing what's important or of concern to them. Focus on social interaction as a competitive differentiator. One reason the buy local movement is popular is because consumers like to know the person(s) from whom they're buying. You can bring the same focus on relationships to your online interactions with consumers. When you're separated from individuals by a computer screen it's easy to put off replying until a more convenient time or to send short, clipped responses. However, by being personal and personable, you can build trusting relationships with your customers and followers that they will appreciate and value. Define a process and framework for dealing with customers. How, and when, will you respond to requests? What's your strategy for dealing with complaints? 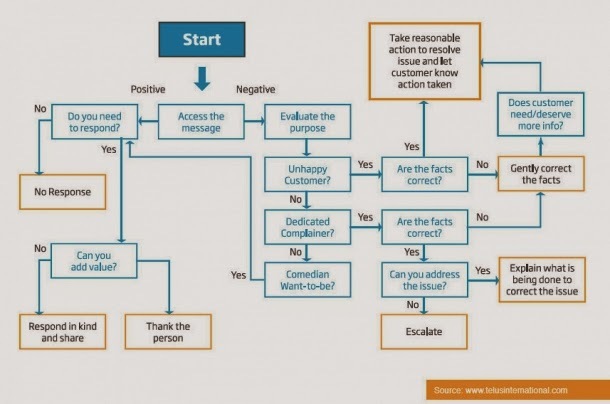 Creating a response map (see example below) may be useful, as you'll want to have a consistent response strategy for everything that comes your way, even praise. With some aspects of your response strategy, such as response time, it may make sense to make this known upfront to your customers with short notices on your social media page, or through an automatic reply. Understand what's behind the complaint before responding. Sometimes, the complaint made is just the tip of the iceberg, and the real issue lies deeper. Ask the complainant clarifying questions as appropriate if you suspect this is the case. Follow through on all channels. If a conversation moves from one channel to another, say from Facebook to email, make sure you indicate that this has taken place. This will allow others who have seen the start of a conversation know that you are in contact with the original poster. You may also want to post the final resolution, or answer, on the original channel for others to see and for the complainant to verify that they have been assisted. Follow up after problems have been solved. Once you have provided a solution or rectified the situation, follow up after a reasonable length of time to ensure your customer's satisfaction. It is possible to provide excellent customer service using social tools, just check out this customer's experience with Netflix. "If you’re not engaging customers during the entire product life cycle through social media, you’re missing out. Because someone else will." Note: Where businesses or trade-names are mentioned, no endorsement is intended.